^ a b c d e f g h i j k l Heinrich, Mark. "Corporate Japanese colony sprouts in West German city." Associated Press at the Houston Chronicle. Sunday November 224, 1985. Page 1, Section 4. Available from NewsBank, Record Number HSC112453511. Available online from the Houston Public Library with a library card. "Duesseldorf has the highest percentage of Japanese residents of any city outside Japan, says Akira Arikawa, general manager of the Japanese Chamber of Commerce and Industry here. The lure: business opportunities in the highly industrialized Ruhr region." ^ a b c d e f Kerbo and Ziltener, p. 230. ^ Kerbo and Ziltener, p. 229-230. ^ a b Kerbo and Ziltener, p. 229. ^ "デュッセルドルフ日本人学校トップ." 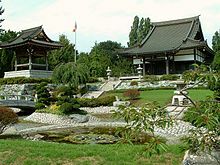 Japanische Internationale Schule in Düsseldorf. Retrieved on 1 January 2014. "Niederkasseler Kirchweg 38, 40547 Düsseldorf GERMANY"
^ a b c "Yokoso! All Nippon Airways (ANA) to Offer Daily Connection between Düsseldorf and Tokyo Starting March 30." Press release from ANA at the website of convention bureau DÜSSELDORF. Retrieved on October 26, 2016. ^ White, Paul. "The Japanese in London: From transience to settlement?" In: Goodman, Roger, Ceri Peach, Ayumi Takenaka, and Paul White (editors). Global Japan: The Experience of Japan's New Immigrant and Overseas Communities. Routledge, June 27, 2005. 1134431457, 9781134431458. p. 89. ^ "ANA Shuttle-Bus" (Archive). All Nippon Airways. Retrieved on October 29, 2016. Kerbo, Harold and Patrick Ziltener. "Japanese Business in Germany." In: Bird, Allan (editor). Encyclopedia of Japanese Business and Management. Routledge, December 6, 2001. 0203996321, 9780203996324. Okamura, Kayko. "Chapter 4: Multicultural Identity in a Global Society: Locality and Nationality of Contemporary Children of the Japanese Diaspora in Germany" In: Adachi, Nobuko (editor). Japanese and Nikkei at Home and Abroad: Negotiating Identities in a Global World. Cambria Press, 2010. 1621968979, 9781621968979. Glebe, Günther. "Segregation and the ethnoscape: the Japanese business community in Düsseldorf." In: Goodman, Peach, Takenaka, White (Hrsg. ): Global Japan. The experience of Japan’s new immigrant and overseas communities. Routledge, Abingdon Oxford 2003, 0-415-29741-9, S. 98-115. "D?sseldorf's Japanese outreach." (Archive) Bundesliga 2. 05.12.2013. "Düsseldorf für Japan-Fans: Klein-Tokio am Rhein." Der Spiegel. Wednesday 27 February 2013.